We’d love your help. Let us know what’s wrong with this preview of The Twelve Dancing Princesses by K.M. Shea. Quinn is a loyal soldier of Farset, willing to risk her life on behalf of her country and squad. So, when a fellow soldier volunteers for a dangerous mission, Quinn joins him. Their assignment is to investigate the nightly disappearance of the twelve royal princesses, a mystery none have solved as those who attempt it vanish. But when she follows the girls, Quinn uncovers Quinn is a loyal soldier of Farset, willing to risk her life on behalf of her country and squad. So, when a fellow soldier volunteers for a dangerous mission, Quinn joins him. Their assignment is to investigate the nightly disappearance of the twelve royal princesses, a mystery none have solved as those who attempt it vanish. But when she follows the girls, Quinn uncovers the truth: the princesses are cursed, and they’re not alone. To ask other readers questions about The Twelve Dancing Princesses, please sign up. I love revisiting the timeless fairy tales, each story is self contained so you can jump into it without having to re-read previous stories. Although reading in order showcases the links between the stories and the bigger evil. The heroine is a very competent soldier who is not dependent on the hero. She actually gets to rescue him several times. The hero sees who heroine is. Loved their interactions, especially their first meeting. Highly recommend this story. This author is always an auto-buy for me due to stories like this. While I enjoyed this book as I have all of the other books in this series plus the Snow Queen duology, this one seemed to be drawn out a bit to make it longer. I think it might have been a small bit better if it had been a very long novella. Quinn and Emerys made a very enjoyable pair and the mix of drama/romance/mystery was done very well but I felt we kind of clunked into the ending of the main story, where the romance ended pretty nicely but still left some things hanging which I assume we mig While I enjoyed this book as I have all of the other books in this series plus the Snow Queen duology, this one seemed to be drawn out a bit to make it longer. I think it might have been a small bit better if it had been a very long novella. Quinn and Emerys made a very enjoyable pair and the mix of drama/romance/mystery was done very well but I felt we kind of clunked into the ending of the main story, where the romance ended pretty nicely but still left some things hanging which I assume we might see more of in the next book. I looved this one! Basically all the books in this series are amazing, but this is probably among the top favorites! And I loved the whole twist on the 12 Dancing Princesses story! I love the w I looved this one! Basically all the books in this series are amazing, but this is probably among the top favorites! And I loved the whole twist on the 12 Dancing Princesses story! I love the way the fairy tales are clearly front and center, but KM Shea always finds a way to reassign roles in a way that just works perfectly well. I love the way that K.M. Shea takes a fairy tale and makes it her own. In a fun twist, the main character in this story is a soldier named Quinn. When one of her squad mates decides to try to solve the riddle of the princesses worn shoes, she and the rest of the squad agree to help him, despite their misgivings. Quinn is loyal, kind, courageous, and intelligent. She soon figures out that there is more to this mystery than twelve dancing princesses. I lo This series keeps getting better and better! I love watching this series unravel. What started as fun fairy tale retellings is now turning into fun retellings with complex plots. As more kingdoms have faced curses and darkness, more is now being discovered about the cause, and a big standoff is looming. I love every new piece I learn about this puzzle, and admire how K. M. Shea could have had this planned all along! I especially loved seeing the Enchantress Angelique and how being everybody's hero is affecting her and wearing her down. I loved that Quinn could show her sympathy and support. Not the previous nine books, no. My unexpected, but DELIGHTFUL journey of traipsing across the continent of both "Entwined Tales" and "Timeless Fairy Tales" began with THIS, K.M. Shea's "The Twelve Dancing Princesses (Timeless Fairy Tales, #10)". I somehow came across this book (probably because I was on a fairytale retelling kick [still am]) and wanted to read more renditions of The Twelve Dancing Princesses. I liked the cover, and added the book to my "to read" pile. However, I realized that this was book #10 in a series. Accidentally, I thought the series "The Twelve Dancing Princesses" was a part of was "Entwined Tales" -a series of six stand alone but best enjoyed together book series by six different authors. So I read Shea's "The Goose Girl" novella of that particular series, enjoyed it, and then realized I was in the wrong series to get to this "Twelve Dancing Princesses" retelling as my endgame. However, I can't just abandon the other series I started; thus, I continued and read the remaining tales and thoroughly enjoying the different's author's styles, the misadventures of seven siblings and their grumpy fairy godfather, and fell in love with new fairytale retellings (particularly "The Bear's Bride" as a retelling of "East of the Sun, West of the Moon" -if you're curious). Therefore, I read the six books of "Entwined Tales", and then started "Timeless Fairy Tales". Around book #7 or #8, I paused this mission to get to TTDP#10 to read the prequel trilogy “The Snow Queen" (which, PLEASE do -it adds so much layering and value to the stories and overall “Timeless Fairy Tales” world Shea built!). I knock out "The Snow Queen" and am slightly sad I don't have my own Colonel Graydim or reindeer, and then return to my ORIGINAL mission of "The Twelve Dancing Princesses (Timeless Fairy Tales, #10)". I have FINALLY achieved reading this tenth addition of the series (19 books later). It was a trek of emotions, a journey of late-night/early-morning reading sessions, sacrifice of sleep or food to finish a chapter, and an overall quest of accomplishing reading this book -WORTH IT. Quinn is a solider and loyal and fierce and absolutely everything I didn't know I wanted in a Twelve Dancing Princesses retelling -especially because she only volunteers to get involved in that mess of a curse, unlike our other heroes who get wrapped into the dark magic by association or situation. Emerys is an elf and loyal and fierce and absolutely everything I didn't know I wanted in a Twelve Dancing Princesses retelling -especially because I was not sure of the significance of elves on the continent until this segment. This story had mystery, romance, war, self-discovery, a wolf pup, an overview of the continental chaos, and -what we have all been yearning for- Angelique at her wit's end, exposing her true thoughts and perhaps her core magic (a type I had not expected, but whole-heartily approved of after reading/discovering). This book was amazing, I love all of KM Shea's books, but this was soooo good! Everything comes together and makes sooo much sense. I love the dialogue and the elves. Especially Emerys, the story was just so cute and I really enjoyed. I love this series!!!! It is official. This one is my new favorite my K.M. Shea! I loved everything about it, and, ELVES!!! Twelve Dancing Princesses had tons of humor, plenty of emotion, and an addictive story line! It combined beautiful bits of the original tales with Shea's enchanting writing and originality. I loved how the conflicts of the magic world from the past books came to a head in this one, and how we got to see a more vulnerable side to Angelique, our favorite Enchantress-in-training! This one showcased S It is official. This one is my new favorite my K.M. Shea! I loved everything about it, and, ELVES!!! This one showcased Shea's writing at its finest! It shimmered with her personality. It blossomed with her imagination, and it had the most enjoyable lighthearted banter between her enchanting characters! I loved Quinn and her fierceness. Her loyalty to her band, her king, and to the elves was incredibly admirable. She was so strong and I really enjoyed watching the change in her personality and love interest. Emerys was probably my favorite male character out of all the books. He was witty, charming, and hilarious. And, of course he was an incredibly handsome elf! I also really enjoyed Alastryn! She was so snarky! I loved reading the banter between her and Emerys, and really enjoyed her role in the story and her friendship with Quinn. And, speaking of banter. This one was full of it! I have not laughed this much since I read Jackaby by William Ritter! It was so refreshing and whimsical to have the humor amidst the magical struggle of the tale. Um, yes, I read this book in 1 day. It's a KM Shea book! Of course I didn't do anything else but read it! I loved this one! I think it is one of my favorites of the whole Timeless Fairy Tale series! After the rather quiet, mostly non-actiony Frog Princess, this book ramps up the tension with a full on battle scene at the end. I really liked the two main characters. Quinn is amazing and Emerys is so cool! I was rather scared at the beginning that this might be the one KM Shea book where I didn't Um, yes, I read this book in 1 day. It's a KM Shea book! Of course I didn't do anything else but read it! One thing I really liked is that while Quinn is very tough and a fighter, she is still a girl. She still squeals over a fluffy, cute wolf cub at one point and appreciates a fancy set of clothes, but she keeps her priorities straight when they matter. And the reveal of Angelique's core magic...wow! I can't wait to see how all of this will be brought together in the next few books! This is easily KM Shea's best book so far. The character development and progression of the story were completely on point. Those who have read the other timeless fairytales stories will find lots of their questions answered in this book. Definetely a great read! Fair warning: don't read this book until you have read the rest of the series. I'm gonna finish this series but only because I'm a ridiculously stubborn person. I love all of the books in the Timeless Fairy Tales series, and this one was amazing! So many questions were answered! one of my favorites. so creative. First off, readers new to this series should know that, unlike the first 8 books, this one (#10) is not a standalone. Start with one of those and see if the series is something you'd like to get into. You could probably get by with just the following 5 books if you're really impatient: Beauty and the Beast, Cinderella and the Colonel, Rumpelstiltskin, Swan Lake, and The Frog Prince. For readers who are familiar with this series already, let's begin the actual review of Kitty's retelling of The T First off, readers new to this series should know that, unlike the first 8 books, this one (#10) is not a standalone. Start with one of those and see if the series is something you'd like to get into. You could probably get by with just the following 5 books if you're really impatient: Beauty and the Beast, Cinderella and the Colonel, Rumpelstiltskin, Swan Lake, and The Frog Prince. For readers who are familiar with this series already, let's begin the actual review of Kitty's retelling of The Twelve Dancing Princesses. Before all else, I have to say this: Mad props to Quinn, the ONLY person in the entire SERIES to drop everything to help out this exhausted enchantress-in-training who has time and again put her own issues on hold to help EVERYONE else! Angelique has become far more than just a wise-old-woman / fairy godmother archetype, so I just have to address her first (sorry to our current main hero and heroine for the delay). We're at a point where Angelique has just become so unhinged from external and internal pressures, we see her one step away from quitting. And then we see her core magic. I'll be honest. My first reaction was, 'Oh, that wasn't so bad.' But then, the more I thought about it, the more I realized, 'Actually, I'd end up hating my own power, too.' Most core magic abilities are multi-purposed. What they're good for is really up to the user. Stil, for example, can charm stuff for defense, communication, good luck, etc., etc. But Angelique has no such choice. With her core magic, what, really, can she do other than injure? No wonder she clings so strongly to learned spells. This book is worth reading for the addition to Angelique's arc alone. However, we also have a strong story in the forefront of the book! I have to give Quinn mad props for several of her decisions throughout the book, honestly. I'm not sure how much I can say without giving away spoilers, so read on at your own risk. The romance was a bit different from the typical K.M. Shea novel, and I actually really liked it (for a change - I wouldn't necessarily want it ((view spoiler)[the falling-for-the-wrong-guy at first is what I'm referring to; I have absolutely no qualms about human-elf relationships xD (hide spoiler)]) to become the new norm ;P)! The curse's loophole was also different; rather than being contingent on romance, it demanded a very specific sacrifice that ended up being more about what's right than about who loves who. I really liked that take, and I think one could make the argument that this particular curse actually /wanted/ to be broken. Okay, ummm, lessee, how do I say this next part without giving away spoilers... I don't like Roy. Plain and simple, I wanted Quinn to deck him so many times. She's better than that, of course, and of course he begs forgiveness at the end and gets it, and I'm not hardhearted enough to hold a grudge in this case... But still. His explanation at the end for why he acted as he did - that explains away his behavior for the second half of the book. But the first half? When he shamelessly flirted with Quinn despite not meaning anything by it, when he knew what she felt for him? When he cornered her into supporting him two seconds after stabbing a metaphorical knife in her gut and TWISTING? (view spoiler)[I'm referring to his announcement that he's going to look into the princess's curse and then marry one of them, and then he just EXPECTS Quinn to be happy for him AND work in close partnership with him to win his future bride who is NOT her. =_=* (hide spoiler)] Fine, fine, I'll begrudgingly forgive him because Quinn does, but don't expect me to ever like him. The elf king, on the other hand, I thought was a fantastically developed character! He's proactive about the curse on his people, doing what little he can to give them even a spark of hope until finally it pays off: Quinn shows up and turns that spark into a flame. And Quinn is awesome. Have I mentioned yet how much I like her? How great she is not just for helping Angelique but for everything she does? I really can't go into specifics without spoilers, but she's capable and relatable, with understandable fears and moments of awe (prejudices, really, but I totally would have had similar feelings in her shoes, with all the reverence paid to elves in her culture and whatnot). This book is my favourite in the series. I just love it so much, I have reread it about 8 times. I can't get enough. IMHO, reteliing 12 putri karangan mba Shea ini hanya side story dari cerita utamanya. Kaum Elf ! Dari cerita Swan Lake, sudah dideskripsikan cerita kaum Elf yang terkurung dalam rumah mereka sendiri. Hutan Alabaster. The King of Elf dan Farset woman's soldier menjadi pasangan dalam cerita ini. Di negeri Farset, tersebutlah ada Raja dan Ratu yang punya 12 anak perempuan. Sang raja mempunyai pasukan soldier yang mumpuni seperti di negeri tetangganya (lupa). cuman jumlahnya lebih sedikit. Quinn terma IMHO, reteliing 12 putri karangan mba Shea ini hanya side story dari cerita utamanya. Kaum Elf ! Di negeri Farset, tersebutlah ada Raja dan Ratu yang punya 12 anak perempuan. Sang raja mempunyai pasukan soldier yang mumpuni seperti di negeri tetangganya (lupa). cuman jumlahnya lebih sedikit. Quinn termasuk salah satu soldier perempuan yang tangguh tapi adorable khas mba Shea. Bersama pasukannya sedang menghadapi serangan Wraith dan Troll yang jumlahnya terus bertambah. Ditambah terkurungnya kaum Peri dan masalah para princess, cukup membuat Quinn bersama rekan kerjanya menghadapi masalah serius. Themarylsin atau Emery (lupa nama lengkapnya) adalah the king of elves yang frustasi menghadapi kutukan yang menimpa kaumnya. Mereka tidak bisa keluar dari tempat tinggal dan dikutuk untuk merayakan perayaan setiap malamnya bersama para putri Raja Ferset. Walaupun ada jalan untuk mematahkan kutukan, tapi Emery sangsi akan ada Elf-Friend yang akan menyelamatkan kaumnya. Bagaimana bisa menemukan Efl-Friend kalau dirinya ngga bisa keluar. Tapi semua itu mulai terlihat dari kedatangan Quinn yang ngga terduga. IMHO....ada kekurangan dan kelebihan cerita ini yang kentara kelihatan. Kekurangannya adalah menurutku karakter Emery dan para Elf lainnya. Mereka ngga seperti yang kubayangkan tentang kaum Elf yang superior dan dingin. Justru sebaliknya, dan Emerys sendiri karakternya seperti Raja muda yang baru diangkat. Kemudian masalah 12 putri ini kubayangin pertamanya, mereka khusus diceritakan sendiri, tapi di sini mereka seperti kena dampaknya ketika kaum Peri dikutuk. Mungkin itu sebabnya mba Shea menciptakan karakter Roy dan keinginannya membebaskan para putri. Kelebihannya, nah....cukup lah menutupi kekurangan cerita ini. Pertama, ini cerita kedua yang mba Shea tulis yang punya potensi love triangle. bagaimana Quinn mempunyai perasaan kepada Roy, dan Emery yang punya perasaan duluan ke Quinn. Gemes deh melihat Roy yang pura-pura ngga melihat ketertarikan Quinn. Kedua, karakter Emery yang meledak-ledak mengingatkanku dengan karakter Puss di cerita sebelumnya. Seimbang lah dengan karakter Quinn yang tetap tenang. membaca kedua karakter bikin gemes, dalam artian adorable banget. oh ya, romancenya lebih banyak disodorkan di cerita ini, yang sukses bikin penasaran gimana akhir cerita mereka. Ketiga, karakter Angelique digambarkan tidak sesempurna seperti cerita sebelumnya. Enchatress ini akhirnya mengakui kalau dia kewalahan menanggung beban menyelamatakan semua permasalahan sihir di tiap negeri. mungking mba Shea menuliskan ini sebagai pembuka untuk cerita selanjutnya. akankah Angelique menemukan happy endingnya sendiri ? penasaran. THE TWELVE DANCING PRINCESSES by KM Shea, book ten of the Timeless Fairy Tales series, is not a novel I planned to read anytime soon. Apparently I planned wrong, because I just finished reading it. And whoa... that was intense. I don't normally enjoy fluffy, lighthearted fantasy reading. No thank you. In speculative fiction, I always choose the ones that are heavy and at least have some decent fight scenes. :O Not that I enjoy blood and gore, because I don't, but it's Well, this was interesting. Quinn was a pretty cool character. I liked the "smiling soldier" bit; it felt realistic and made sense to me on a very relatable level. *Quirks eyebrows* The relationship among Band Gallant was really sweet and fun to read about, particularly the interactions between Leigh and Guy. *Insert eyeroll* Of course, I found Roy absolutely distasteful from the very beginning (that may or may not have something to do with the fact that I... um, I have wandering eyes that don't ever seem to stray from spoilers). I thought he did apologize quite nicely at the end, so it left me feeling pretty good. Emerys was an... interesting character. I've never read a KM Shea hero quite like him. There are plenty of hers that are "brash" and "sarcastic," but none of them can shapeshift into mice and none of them stutter when they're embarrassed. Of course, I'm still getting weary of the similar characteristics among too many KM Shea characters (it's why I treasure people like Elise & Falk from THE WILD SWANS and Gemma from RUMPELSTILTSKIN and Snow & Fritz from SNOW WHITE), but hey, things are changing in the Timeless Fairy Tales world, so it was acceptable. Then. Yeah, so, um... is there anything else to talk about...? The actual fairytale. Ah yes, that. Every retelling of "The Twelve Dancing Princesses" fairytale humanizes the questionable actions of the said princesses, which I appreciate as we all realize the original ones were quite... let's say, morally crooked. Not to mention their rather homicidal father. But that's not the point. I liked how Kitty pulled this one off; it was real neat. Anyways. Enough of this... pointlessness. I'm not exactly getting anywhere in this review, am I...? I was drawn in at the very first paragraph - I loved that Shea just dropped me into the story. Yet, it wasn’t confusing, it began clearly with a simple action scene that introduced me to the characters and setting. The tight kinship within Band Gallant was admirable and I thought that the members complimented each other. For some reason, groups like that always get me - the devotion but also playfulness makes me smile. Now to Quinn… She was fantastic. Probably one of my favorite heroines ever. W I was drawn in at the very first paragraph - I loved that Shea just dropped me into the story. Yet, it wasn’t confusing, it began clearly with a simple action scene that introduced me to the characters and setting. The tight kinship within Band Gallant was admirable and I thought that the members complimented each other. For some reason, groups like that always get me - the devotion but also playfulness makes me smile. Now to Quinn… She was fantastic. Probably one of my favorite heroines ever. Wait, what? What did you say? Yes, one of my favorite heroines! She was brave and faithful and kind and, and… She was amazing. She made mistakes, she wasn’t always perfect and that made me like her even more. Then there was Emerys. Often the male love interests are portrayed as rather perfect, but I think what made it different with this one, was the way he interacted with Quinn. He teased her in a down-to-earth sort of way and she fired right back at him. Plus, the animals he turned into were quite humbling. And actually, that surprised me because he was often in animal form and so there wasn’t a lot of, “His sculpted muscles were clear beneath his shirt,” or “I laid my hand on his rock hard chest,” or “his starry blue eyes stared down at me.” (cough, gag, cough) you get the picture. So ya that was a nice change. Now that I’ve ranted about the characters forever, let’s move on to the plot. Umm YES. What a twist on the Twelve Dancing Princesses! Not what I was expecting, but I definitely loved it. The only thing is that perhaps a tiny bit more complexity would have been nice. But maybe that would have taken away from the beauty of the story. I can’t entirely say for sure, but I am definitely hoping for a sequel. Finally, it was a clean read and I absolutely love that! I was able to thoroughly enjoy it and feel good about reading it. So, as with all of Shea’s writing, I definitely recommend it. Alright, I'm too lazy to type up a review for all ten books, so I'm tacking all my comments to this most recent one, because most of them cover the entire series anyway. The thing I loved most about these books were the characters: Shea wrote these vibrant, diverse, fun characters, yet managed to make them utterly realistic as well. So many authors in fantasy tend to almost overdo the characters, every good trait is a superpower they never turn off and every bad trait is a fatal flaw, most of the Alright, I'm too lazy to type up a review for all ten books, so I'm tacking all my comments to this most recent one, because most of them cover the entire series anyway. The thing I loved most about these books were the characters: Shea wrote these vibrant, diverse, fun characters, yet managed to make them utterly realistic as well. So many authors in fantasy tend to almost overdo the characters, every good trait is a superpower they never turn off and every bad trait is a fatal flaw, most of these characters have one defining feature that colors EVERY interaction they have. The characters in these books were fairly simple and straightforward, but in the same way that your neighbor or your friend is simple and straightforward- their traits are subtle and change in different circumstances. Of course, besides their realistic, I appreciate how Shea throws in the real life humor as well, the interactions between some of the love interests is perfect and I especially liked the family relations- the sibling interactions in wild swans was especially funny and accurate. The plot is fine, she keeps dropping hints about some end game that hasn't really been thouroughly pieced together yet but that's ok. She ties in past (and future) characters into the story-sometimes more naturally than others. Joy and happiness, this was another excellent book of Miss Kitty's. Quinn was a lovable heroine, and her and Emerys were as entertaining together as Elle and Severin. Quinn was sarcastic, self-sacrificing, diplomatic, and a thoroughly interesting character. Emerys was also sarcastic, as blunt as Quinn was diplomatic, caring, and quite entertaining. The two together, as I've said, provided a positive feedback look of sarcasm. It was wonderful. The world-building, as usual, was excellent, without Joy and happiness, this was another excellent book of Miss Kitty's. Quinn was a lovable heroine, and her and Emerys were as entertaining together as Elle and Severin. Quinn was sarcastic, self-sacrificing, diplomatic, and a thoroughly interesting character. Emerys was also sarcastic, as blunt as Quinn was diplomatic, caring, and quite entertaining. The two together, as I've said, provided a positive feedback look of sarcasm. It was wonderful. The world-building, as usual, was excellent, without overmuch of the story devoted to it. One reason I love Miss Kitty's books is that I always feel like I am where the characters are, in this case, a forest or city. The Secondary characters (Band Gallant, and Guy in particular) were fairly well fleshed out and provided an excellent support for Quinn. I loved the new twist on the Twelve Dancing Princesses, where the princesses aren't so much victims as the ones who chose their own fate. This review is incredibly disorganized because I keep remembering things that I liked, but I should probably stop now. Just one last thing--the king and queen are quite diverting. When Quinn's band mate Roy says he wants to find what's causing the princesses of the kingdom shoes be in tattered bits every night. She felt her world could end. She really likes Roy and if he solves the riddle. He will have his pick of a Princess to marry. Her heart breaks at his thoughtlessness. But she must stay on point and help her band mate to solve the riddle. After an assignment of going through the woods, she meets the Enchantress-in-training, who give Quinn an enchanted done with a nice spell sown into. She also investigates why some many of the people who have tried to solve the riddle, fell asleep on their watch. Their, Roy and Quinn's, first night discovering where the 12 princesses go and do. She learns it's not just the princesses lives at stake, but the elves. Quinn wanting to learn more about the curse on the elves venture to their forest. In so doing, helps saves a mouse when goblins attack and so doing learns the mouse is an elf. She becomes a friend of the elves by a simple rite. This book had me laughing a lot with the witty banter and the realness to the other, mostly Queen and the Elven King. It's an unlikely take of love in an unusual setting. A sweet book with lovely characters. A fun and light read, this fairy tale retelling was nicely done. I think there might have been a few too many characters to focus on, so some felt left out, but overall the author did a great job of juggling them. References were dropped, tears were shed and interesting food and drink was enjoyed. I really like Quinn, while Emerys sometimes grates on me a little in the later part of the book. Quinn had a lot of character development, but it just scraped past fe A sweet book with lovely characters. A fun and light read, this fairy tale retelling was nicely done. I think there might have been a few too many characters to focus on, so some felt left out, but overall the author did a great job of juggling them. I really like Quinn, while Emerys sometimes grates on me a little in the later part of the book. Quinn had a lot of character development, but it just scraped past feeling rushed. Instead it was nice to see. I did catch characters slipping from their roles a time or two and some strong stereotypes were applied to make others memorable, but the core cast did a good job and it had some lovely twists. Overall: Lovely fluff with some fun fighting scenes and plot thrown in. Absolutely delightful! Shea's retelling is well done and a wonderful addition to the series. It did not take long before Shea had me hooked and I found it hard to put down. I cannot wait for the next installment; it seems that our heroine from this novel will be continuing on into Book 11. While Quinn did get her happily ever after, the overall series angst continues.... I am not sure but I think we are closing in on the end of the series. That said, the characters were enga 4.5 Stars! Happy sigh! I'm going through a rough patch right now, so this was a nice escape. I actually looked back at some of my old reviews for other books by this author, and while I remember feeling lukewarm about her previous work, this one did win me over. That being said, a few things did take me out of my enjoyment of it a bit. Quinn, her band, Emerys, and Angelique were all interesting and fun characters, but despite the romance between Quinn and Emerys starting at a gentle pace, I felt that their feelings pro I'm going through a rough patch right now, so this was a nice escape. I actually looked back at some of my old reviews for other books by this author, and while I remember feeling lukewarm about her previous work, this one did win me over. A return to form for the fairy tale series. Quinn is a very relatable character as a young woman who hides her own emotions and discomfort to make things easier for others. I had thought the romantic elements in this series were beginning to get weaker, but there was plenty of time given to the central couple in this volume and they worked really well. 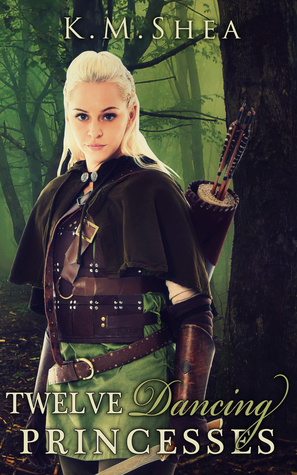 Emerys is grumpy and witty and one of my favourite heroes in this heroes, although I generally prefer elves and other non-human characters to be A return to form for the fairy tale series. Quinn is a very relatable character as a young woman who hides her own emotions and discomfort to make things easier for others. I had thought the romantic elements in this series were beginning to get weaker, but there was plenty of time given to the central couple in this volume and they worked really well. Emerys is grumpy and witty and one of my favourite heroes in this heroes, although I generally prefer elves and other non-human characters to be more alien in their outlook. This is somewhat explained in the story though. If I could, I would give this book TEN stars! This series has been entertaining from the start, and this is one of the best. I can't choose just one best book out of the series, but this is one of my all time favorite series I've read. Fast paced, well developed characters, good editing, and an amazing adaptation of the original fairy tale. If you have not yet read any of the Timeless Fairy Tales, I highly suggest you start immediately. This book can be read without having read the other Amazing! I like this series, and this has to be one of the stories i like the most. Plotwise it is not my favorite (probably because the twelve dancing princesses never were a fairytale i particularly liked), but characterwise Quinn is definitely my favorite protagonist so far. I really liked her, and she and Emerys were adorable together. Really liked their interaction and chemistry. I also liked the interaction between Angelique and Quinn. Finally get to see a different part of Angeliqu I liked this one. I also liked the interaction between Angelique and Quinn. Finally get to see a different part of Angelique and someone who think to ask her if she needs help (poor thing). K.M. Shea is going progressively bald from pulling all of her hair out when she writes. She has a BA in Print Journalism and a minor in Japanese. She's worked as a freelance reporter, a librarian, a blogger, and an author. She lives in the country with Perfect Dog.